Compatibility: Requires iOS 4.0 or later. Compatible with iPhone 3GS, iPhone 4, iPhone 4S, iPhone 5, iPhone 5c, iPhone 5s, iPad, iPod touch (3rd generation), iPod touch (4th generation) and iPod touch (5th generation). This app is optimized for iPhone 5. 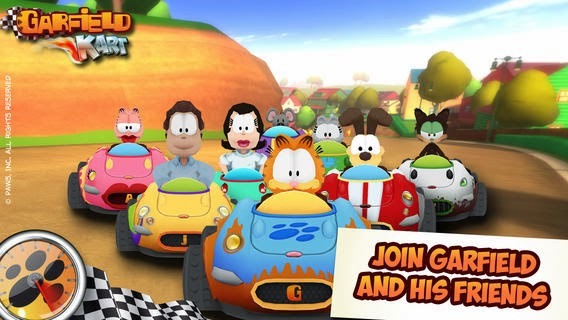 Join Garfield and his friends in the funniest fast and fur-ious game! What character do you want to play with? Garfield, Odie, Jon, Nermal... you choose! 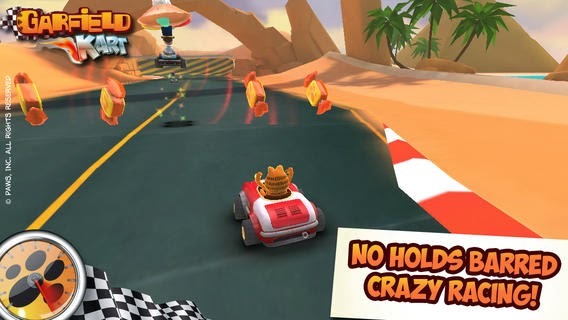 Take part in no holds barred crazy races in either multiplayer mode or against the computer! Challenge your friends whatever platform they're on (mobile, tablet, PC, Mac, etc...) thanks to the CROSSPLATFORM multiplayer mode! Use your best driving skills and the bonus objects to be 1st across the finish line! But watch out... it's a free for all out there! Unfortunately the game is not compatible with the iPod Touch 4th generation, we are sorry that it was made available to those devices. We apologize for any inconvenience. • 8 CHARACTERS - Garfield, Odie, Jon, Nermal, Arlene, Liz, Harry and Squeak. • ONLINE MULTIPLAYER MODE and LOCAL MODE: invite your friends and take on up to 5 opponents! Multiply the mayhem! •CROSSPLATFORM multiplayer mode - challenge your friends on any device! All they need is the game! • DAILY CHALLENGE: try out a new challenge every day!